BOA Compression Back Brace with Chairback – Pacific Medical, Inc. The BOA braces provide rigid anterior and posterior compression from L1 - S1. 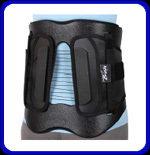 The 8" Low Profile brace will accommodate most patients. The 10" Regular model is designed for patients with longer torsos.